Jofran, Inc. is a leading importer and distributor of home furnishings from around the world with factories in Asia, Vietnam, China and Indonesia. The furniture manufacturer also has a 3PL that just recently opened in Moreno Valley, CA and has its own distribution center just right outside of Boston, MA. With a commitment to creating affordable and functional furniture with style, Jofran needed to evolve its time-consuming business processes in order to keep up with demand and ensure superior customer satisfaction. Before implementing HighJump (WMS), operations were a chaotic nightmare. By utilizing carbon paper as its only form of inventory control, visibility was non-existent, mis-shipments were the norm, and the company experienced a considerable amount of shrinkage due to theft. By eliminating its costly, manual warehouse processes, Jofran was able to increase productivity by more than 50%. Jofran selected HighJump WMS because of the seamless integration between Microsoft Dynamics GP and other supply chain solutions enabling its IT department increased freedom. In addition, Jofran selected HighJump because of its excellent implementation and support team. “We selected HighJump WMS because the team there actually cares about our business. When you talk to the HighJump staff, they personally know you. Out of all the vendors I have, the HighJump support team is the best. The implementation process is very smooth and they essentially tell you what to expect. There’s a project manager always working with you and they are more than happy to help you along to get the project done, even in times when you need a little more help from them,” said Ra Jeffrey, IT Manager at Jofran. When Jofran first started utilizing the advanced functionality of HighJump WMS, the company had a staff of 110 in the warehouse and was able to reduce personnel down to 40 due to all the productivity gains of wireless hand-helds, shipping stations and automatic label printing. HighJump WMS has also allowed Jofran to gain real-time inventory control and has completely eliminated shrinkage. By leveraging the integrated, flexible picking processes, Jofran now has the visibility to mitigate attempted mis-picks as they occur so product does not ship incorrectly. This has reduced the company’s error rate down to one in 30,000 mis-shipped items. 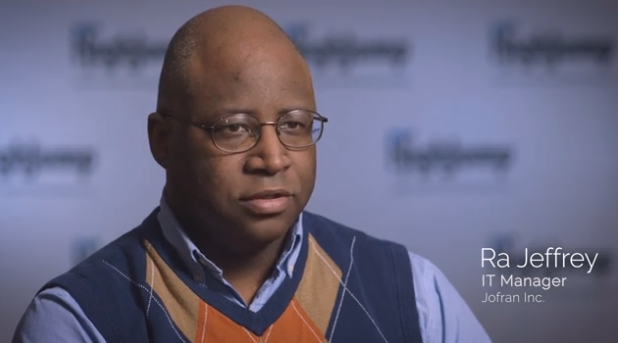 Watch the three minute video above to learn more about the benefits Jofran has gained after implementing HighJump WMS and why Ra Jeffery endorses HighJump and its flexible supply chain execution software.